Women angered by the bitter fight over a US Supreme Court nominee and what they called the "anti-woman agenda" of the Trump administration headed into the streets of Chicago on Saturday in a display of political might. 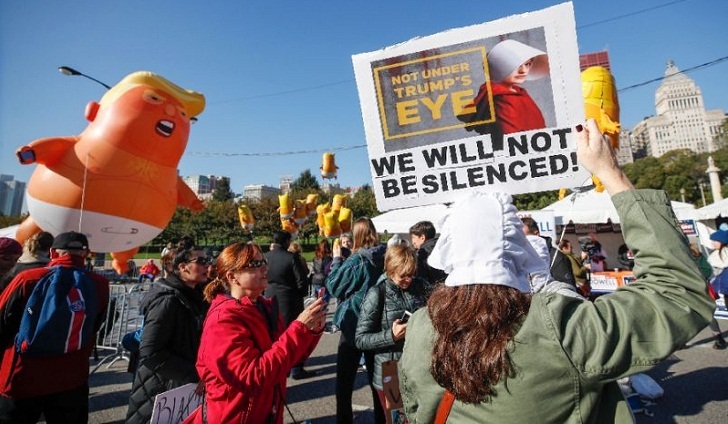 Thousands gathered at a rally organized by Women's March Chicago, which is aimed at spotlighting the power and determination of women voters ahead of the crucial November 6 midterm elections, which will determine control of the US Congress. The elections are also being seen as a barometer of President Donald Trump's popularity. "We wanted to lead into the midterms and encourage women to get out and vote," Jessica Schiller, head of Women's March Chicago, told AFP. Saturday's events include a "Voter Village" where dozens of community groups and politicians have set up booths to reach new voters and encourage political involvement. Demonstrators planned to leave the rally site from 12:30 pm (1730 GMT) for a formal march through downtown Chicago before heading to early voting locations in the Windy City's business district. The Chicago rally was among the first signs of the political fallout from the deeply partisan fight to confirm Trump's nominee Brett Kavanaugh to the nation's highest court despite sexual assault allegations and powerful testimony against him at a Senate hearing by his accuser Christine Blasey Ford. Women's March Chicago said it was targeting the "anti-woman agenda of the White House and the Republican Party." Similar marches are scheduled later this month in other states, including the Republican strongholds of Texas, Georgia and South Carolina. "It is infuriating to women to watch that display that we watched in that Senate committee hearing, and to see that that man was still confirmed," Schiller said. "Women are angry. And we're starting to feel comfortable being angry." Republicans currently hold the White House and both chambers of Congress, but many in the party fear anti-Trump voters will overwhelm the president's supporters in the elections, pushing the House -- at least -- over to the Democrats. The Chicago protest came with early voting already under way in Illinois and more a dozen other states. Others are soon to follow. Chicago organizers insisted their event -- where a giant, diaper-wearing "Baby Trump" balloon made an appearance -- did not favor any one party, even though funding came largely from trade unions and Democrat-aligned groups. "We want to take back the reins of a government that is out of control, and give (them) to lawmakers who can steer us always in the right direction," Women's March Chicago organizer Eman Hassaballa Aly told a news conference this week. Previous women's protests have included plenty of anti-Trump rhetoric.